General Information: Timmer GmbH was founded in 1978 and is DIN EN ISO 9001:2000 certified. With over 100 employees, we are globally active in the fields of pneumatics and accessories, pumps, vacuum technology and vacuum lifting technology. As a matter of principle, we will only supply commercial customers and will love to send you our catalogues for free. 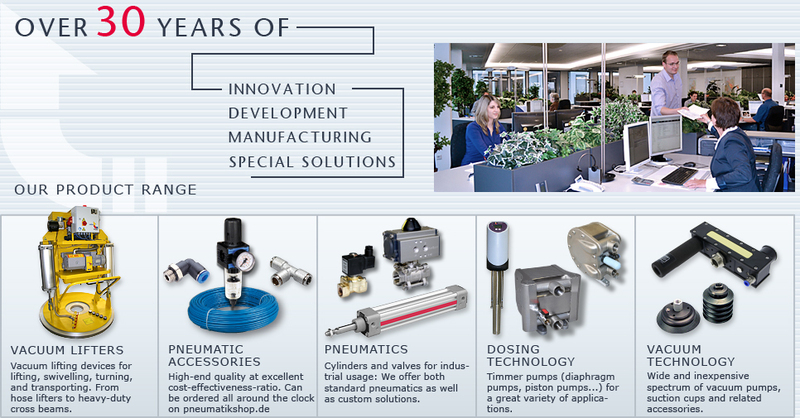 The Timmer GmbH is a company manufacturing pumps and dosing technology. A focus is on air operated double diaphragm pumps (AODDs compressed air diaphragm pumps, high pressure diaphragm pumps) and pneumatic piston rod pumps (glue pumps, coagulant pumps). In the field of pumping technology, we also built customized solutions meeting our customer's needs. We are supplier for pneumatic cylinders, pneumatic valves and pneumatic accessories, as well as for custom pneumatic solutions like special cylinders and large cylinders, which are integral parts of our product range. We could convince many of our customers with high quality products, technical knowhow, innovative custom solutions at favourable cost-effectiveness ratio. Our catalogue for pneumatic accessories lists prices (only in Euros) and information on fittings, hose connectors, tubings, pneumatic motors, pneumatic cylinders, hose clamps, silencers and many more. We also supply solenoid valves and special cylinders. Timmer GmbH does not only manufacture standard vacuum lifters (coil lifters, vacuum swivelling cross beams, vacuum cross beams) but also special lifters for various applications and tasks and does also offer consultation and maintenance services. Our vacuum lifting devices are for handling loads ranging from 2kg (hose lifters) to over 20,000 kg (heavy duty cross beams). As supplier for an extensive range of vacuum technology we offer vacuum pumps, air operated ejectors, Venturi nozzles, vacuum accessories and special solutions in these fields. Our products are inexpensive and known by the brand name TIVAtec.